Hamilton Princess & Beach Club has launched a special menu to celebrate local food and ingredients, as part of the Made in Bermuda Nights Festival, at Marcus’. “Hamilton Princess & Beach Club has long been an advocate for buying local produce and fish but has increased its commitment in the last few years,” a spokesperson said. “The culinary and purchase team at the hotel have strengthened their relationships with local farmers and fishermen and have increased local purchases by 300 per cent, compared to the same period last year. 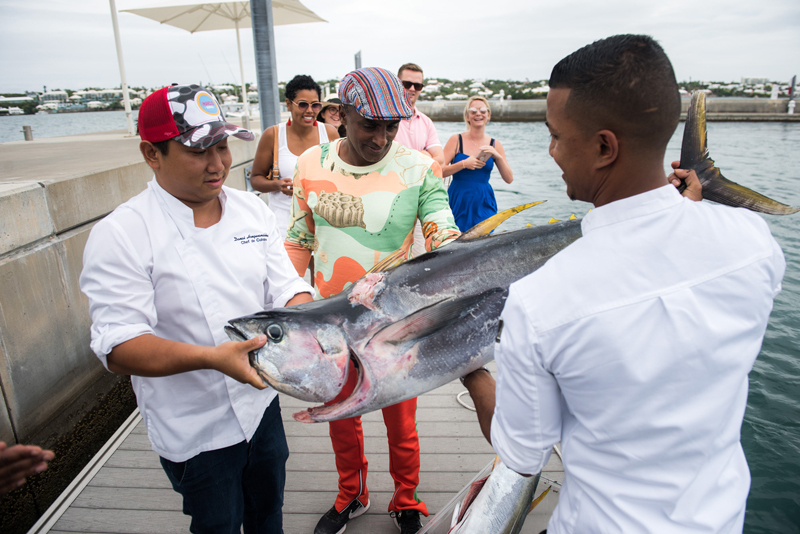 “In June, the hotel hosted a Farm to Table Tour with celebrity chef Marcus Samuelsson, spotlighting some of the local producers that the hotel works closely with. Hamilton Princess & Beach Club have also been offering locally caught lionfish, sourced from BIOS, at special events. “The special menu features Salt Cod Bites, with Gosling’s Rum and Coconut Chowder; Kale Salad with Pickled Paw Paw, Miso Garlic Dressing, Raisins and Tucker’s Farm Goat Cheese; Gombey Pepper Jam Glazed Baby Back Pork Ribs with Wadson’s Farm Potato and Corn Salad and Pickled Vegetables; Pan Roasted Snapper Banana “Ketchup”, Rice and Peas, Baby Bok Choy. “Dessert is also a local affair, with diners having the choice of either Banana Fritters with Cardamom Sugar and Coffee Ice Cream or the Railway Trail Pimento Leaf Crème Brûlée served with Strawberry Compote. The Made in Bermuda menu is available every Thursday until 31 August between 6pm and 10pm at Marcus’ and costs $55 for three courses. Drinks and gratuities are not included. Reservations are recommended and can be made by calling 298-2028 or emailing ham.diningreservations@fairmont.com.